I have been using Noetpad++ for more than 2 years. It is a wonderful editor – it is very light and feature rich. I use it for editing any text files (txt, ini, C, C++, html, css..). 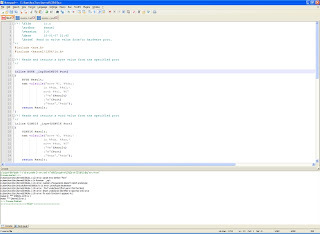 I was happy with Notepad++ for editing my C project source files. Only thing I didn't like was, to compile I have to go to command prompt and then to correct errors I have to note down the line numbers and open notepad++ modify…. make 2> err; - run make and redirect errors to “err” file.